Beef, lentils, tomato pomace, sunflower oil, natural flavor, dicalcium phosphate, salmon oil (source of DHA), salt, DL-methionine, choline chloride, taurine, dried Lactobacillus plantarum fermentation product, dried Bacillus subtilis fermentation product, dried Lactobacillus acidophilus fermentation product, dried Enterococcus faecium fermentation product, dried Bifidobacterium animalis fermentation product, vitamin E supplement, iron proteinate, zinc proteinate, copper proteinate, ferrous sulfate, zinc sulfate, copper sulfate, potassium iodide, thiamine mononitrate (vitamin B1), manganese proteinate, manganous oxide, ascorbic acid (vitamin C), vitamin A supplement, biotin (vitamin B7), niacin (vitamin B3), calcium pantothenate (vitamin B5), manganese sulfate, sodium selenite, pyridoxine hydrochloride (vitamin B6), vitamin B12 supplement, riboflavin (vitamin B2), vitamin D3 supplement, folic acid. For adult dogs over 100 pounds, add 1/2 cup for every 10 additional pounds. For pregnant or nursing adult dogs, we recommend free-choice feeding. Some dogs may require more or less food than the guidelines depending on activity level and other factors. 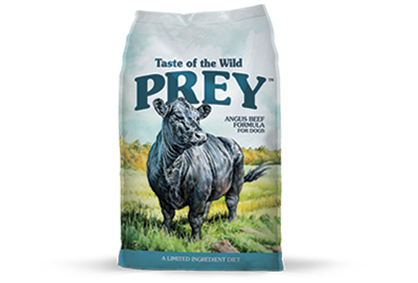 Taste of the Wild PREY Angus Beef Formula for Dogs is formulated to meet the nutritional levels established by the AAFCO Dog Food Nutrient Profiles for All Life Stages, including growth of large size dogs (70 lbs. or more as an adult). Angus Beef Formula for Dogs is rated 4.6 out of 5 by 239. Rated 5 out of 5 by Annie from the dog food search is over! yay me! Thank you for this limited ingredient food. My pup can't have chicken and so many products are chicken based. The vet says to limit her proteins due to her allergies. UGH! So I needed to find a quality limited ingredient beef based food. She has eaten Taste of Wild but there were too many proteins. I was so happy to see PREY. She loves this Angus Beef Formula. Its helps that I make my own beef meatballs to add to it. The price is decent. 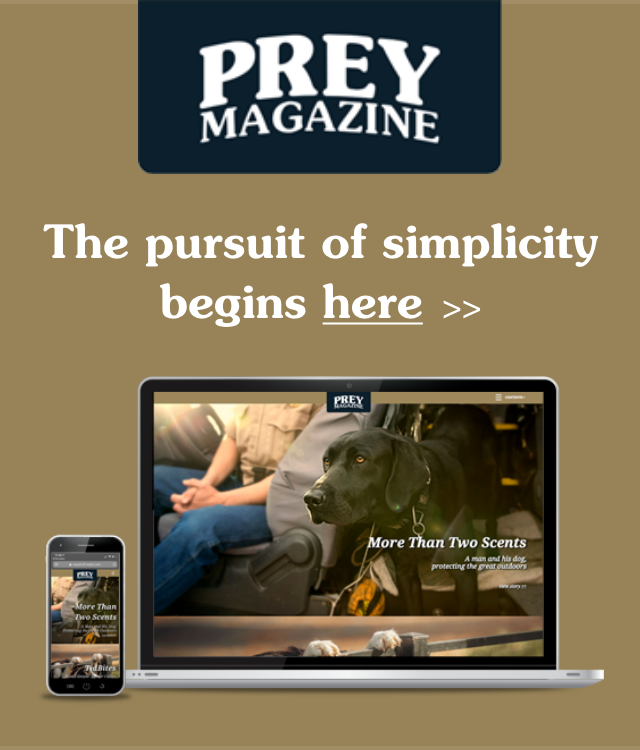 I'm praying that PREY is successful and stays in the market. Maybe I'll see it on online sites soon, so it can be delivered to my door. Rated 4 out of 5 by oliviah7 from Both of my dogs, a 4 pound Chihuahua and 95 pound Great Dane, really loved their sample of Taste of the Wild. I gave them an option between this, and their regular food, and both immediately went for Taste of the Wild, then honestly looked sad when it was gone! I took off one star because the price is about $50 per 30lbs, which is understandable for the quality of ingredients, but still a bit high. I will purchase this for my little dog and mix a bit in with my big dog's regular food, because they really do seem to love it. You can see in the photo they have completely finished off the sample and ignored the other food! Rated 5 out of 5 by miss_chelsea_adriana from Let me begin this review by saying I have arguably the pickiest puppy in the whole world, but the minute the Taste of the Wild Prey food arrived from Influenster, he was so excited he started pulling the paper out of the box, eager to try it! I gave him a few bits as suggested to see if the flavor side will hold up his interest, and to my surprise and his excitement he loved it! I poured him a bowl during his normal meal time and he completely demolished his food! Knowing that what I'm feeding my little boy something that he not only loves but is good for him makes me a happy momma bear! Rated 5 out of 5 by Jpereira1964 from Simply the best I adopted a Portuguese podengo medio last November. I struggled to get the right dog. 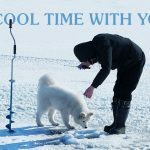 I tried several other premium food and my dog was constantly itching himself, dry flaky skin, loose stools. I then taste of wild I use prey bison. Our dogs coat is beautiful, rarely scratches himself, hardly sheds at all no further Loose stools. I will never try another brand. Rated 5 out of 5 by Jasper62 from Finally, a food for sensitive stomach issues! I have a collie with a sensitive stomach. We have tried several different limited ingredient foods without success. The pet store recommended the Prey Angus beef formula. I was pleasantly surprised that my dog's digestive issues have resolved and he loves the food! He licks his bowl clean at every meal. I am so glad that we finally found a food that he can eat without issues. Thank you! Rated 5 out of 5 by Shari from Angus Beef Formula for Dogs Thank you for offering this alternative for dog's that have chicken allergies. I have been feeding Elite Sports Dog Food until they discontinued their grain free beef formula. After a thorough search, I found your food to try. What a huge relief that my dog is doing well on your food. I hope you will continue manufacturing this formula. With a little advertising, you could pick up some of the Elite Sports Dog consumers. Rated 5 out of 5 by Alexstar from My Puggle Loves it! Princess is 2 years old. She threw up on every food i bought for over a year. After numerous vet visits they found nothing wrong other than inflamed intestines. I decided to try this"limited ingredient" dog food after 3 months of her eating only boiled beef and rice. She has never thrown up or gotten sick since. It is perfect and it smells great. Her digestion is totally normal now. Thank you thank you . How can I get a sample of the Angus Beef? Hi, Sarah! We&rsquo;re happy to hear you&rsquo;re considering feeding Taste of the Wild PREY to your dog. To obtain a sample, please email us by visiting https://www.tasteofthewildpetfood.com/contact-us/ or stop by your local retailer. Where is your dog food produced? Hello, Doug and thanks for reaching out! We have five manufacturing facilities, all located in the United States &ndash; two in California, one in Missouri, one in Arkansas and one in South Carolina. I have a dalmatian that requires a low purine diet. Currently I am using your lamb dog food which is fine . I noticed some new choices today. Are any as low as your lamb ? Hi Kenneth - we sincerely apologize for the delayed response! Purine levels have not been measured in our foods. If you have any additional questions, please don&rsquo;t hesitate to give us a call at 1-800-342-4808 or email us by visiting https://www.tasteofthewildpetfood.com/contact-us/. Thank you! Which dog foods are completely grain free? Hi Kathryn, all of our Taste of the Wild and Taste of the Wild PREY formulas are grain-free. How large are the kibble pieces? &nbsp;My dog prefers a larger piece os kibble, rather than the seemingly standard small pellet size. Thanks in advance! Hello! The kibbles in our Angus Beef Formula for Dogs are a flat, oblong disc shape and approximately the diameter of a dime. Hi, Our dog is allergic to chicken and turkey. Is the Taste of the Wild High Prairie formula poultry free? Thanks! Hello and thanks for reaching out! Our High Prairie Canine Recipe contains chicken meal; however our High Prairie Puppy Recipe does not contain chicken or turkey. 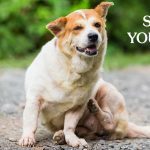 This is an all life stages recipe and is formulated to meet the needs of dogs of all ages and sizes, meaning your pup can enjoy it throughout adulthood. In addition to our High Prairie Puppy Recipe, we offer five additional poultry-free options for you and your pup to choose from. Of the TOTW line, our Pacific Stream Puppy, Pacific Stream Canine, Pine Forest Canine, Southwest Canyon Canine and Sierra Mountain Canine recipes do not contain chicken or turkey. Of the TOTW PREY line, our Angus Beef and Trout Formulas do not contain chicken or turkey. If you have any questions or would like to request samples, please contact us by visiting our website https://www.tasteofthewildpetfood.com/contact-us/. Hello and thanks for reaching out! Our canine formulas contain potassium iodine as a source of iodine and provide 2.5 mg/kg of iodine as-fed. Hello, Margaret! The kibbles in our Angus Beef Formula for Dogs are a flat, oblong disc shape and approximately the diameter of a dime.